Interesting paper I hadn’t noticed before! 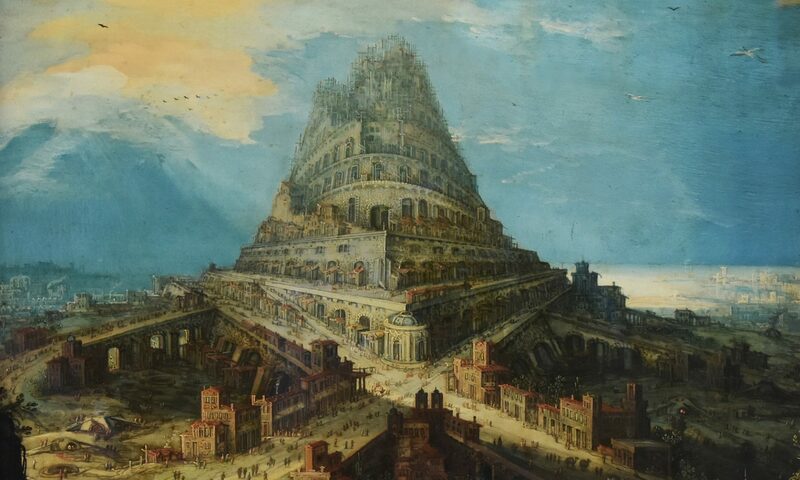 The most impressive result to me is that when the doc-vecs and word-vecs are co-trained, you can use the word-vecs to navigate the doc-vec space. I’m a bit disappointed the authors don’t share all their training parameters – such as skip-gram window-size, frequent-word subsampling, and gradient-descent alpha-rates. Also, that they don’t mention whether the DM modes offers the same benefits – that already inherently co-trains word and doc vectors, and according to the PV paper is better for many purposes. I’ve been working on improving the gensim Doc2Vec implementation, and my changes pending integration will allow its DBOW mode to co-train the word-vectors, by adding the `dbow_words=1` parameter. (In the abbreviated names I use in that code, I call this mode ‘dboww’ for DBOW + Words.) The patched word2vec.c+sentence-vectors example code that Tomas Mikolov once posted to the word2vec list always did this co-training, and only with this training do you also get usable word-vectors from DBOW, so it seemed natural to add even before seeing this paper. Further, looking closely at the graphs from this “Document Embedding with Paragraph Vectors” paper, I don’t think they’ve shown a unequivocally broad advantage for co-training. In figure 4 (hand-built dataset), PV without word co-training is better at some lower dimensions, then slightly worse over 1000 dimensions… then there’s no more comparison. 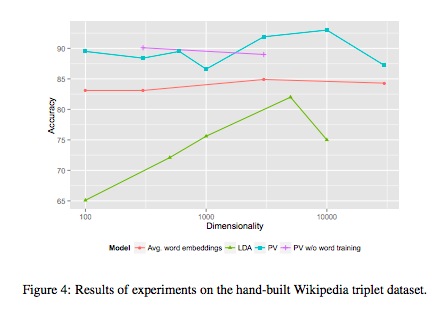 In figure 5 (automated Wikipedia categories-based dataset), “without word training” is just slightly worse, at the two dimensionalities tested. 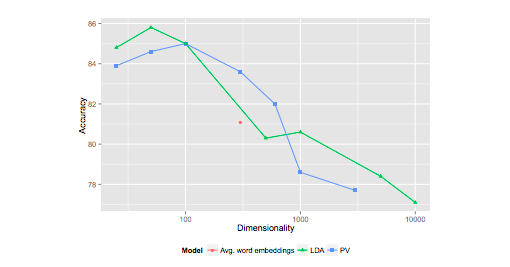 So I suspect that rather than a general result, this superiority for word-co-training is dependent on dataset, task (doc-similarity vs sentiment, etc), and parameters. Of course, the ability to use the word-vecs to add/subtract concepts from the doc-vecs may be so useful that even ‘worse’ doc-vecs are OK, to get that ability. The sharp drop-off in PV performance on the arXiv dataset, for large dimensionality, may be because the model is essentially using all those free parameters to memorize other non-topic-related tricks for doing well on the word-prediction training task. Some vague rules-of-thumb that relate a corpus vocabulary, size, diversity, etc with an optimal set of PV parameters for topicality-uses might be possible with much more experimentation. Is this a NIPS paper? I googled a while and found it’s listed in the first author’s google scholar profile as an arxiv paper. Hi bigpalm, I wasn’t there myself, but is what on the website of the DL workshop at NIPS 2014 that I found the paper (see the almost invisible PDF link above). I haven’t asked the authors about this. Thanks. Found it too. One question w.r.t. Paragraph Vector is, if we derive a paragraph embedding for each sentence in a document, how we are going to train the classifier for that document? Simply concatenating the embeddings is probably not good, since the order of sentences/embeddings is unimportant. The description in the experiment on IMDB in “Distributed Representations of Sentences and Documents” seems to suggest that they trained one vector for a whole review.